The Scottish Premiership was anything but dull over the weekend. Six scheduled fixtures produced 18 goals, 5 red cards and plenty of talking points. Whilst I would normally have focused on the Celtic match our attention was drawn toward the bigger picture of discipline and refereeing. That has now been eclipsed by a far more serious issue. It isn’t a new subject, but rather something of a historical, ongoing, unresolved disease. Think of it as a cancer that has spread across our game but unlike the old man Scottish football is, he refuses to have it investigated by a doctor. A huge thing was made of Neil Lennon’s reactions at Ibrox. The home fans were outraged at Lennon’s celebrations during the match. It prompted a statement from the fans group Club 1872. They appeared to be unhappy with his happiness at beating their team. Of the gestures made by Lennon one was deemed as going a bit too far, but wait. The same guy has received verbal and physical abuse from the day he set foot in Scotland by your very own fans not to mention throughout that match. On top of that the media have continued to paint an unpleasant picture of the Northern Irishman. 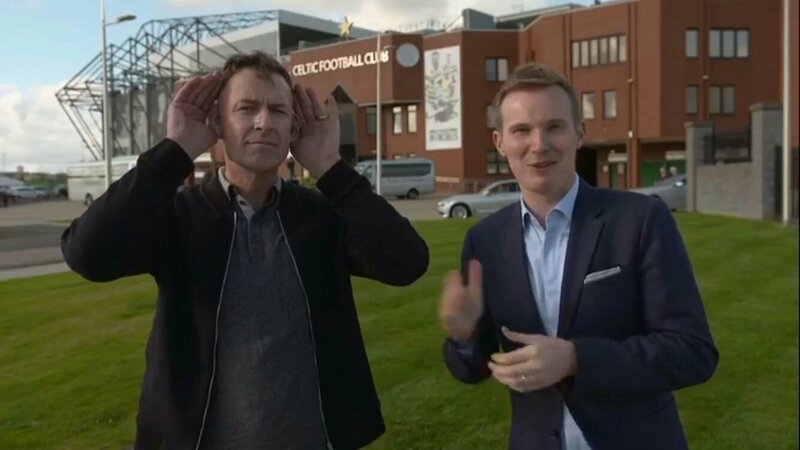 That agenda came to interesting peak on Sportscene at the weekend. Unsurprisingly, the studio pundits threw the book at Lennon. This is standard practice and think Lennon as ‘brings it on himself’. Interestingly Michael Stewart revised his comments yesterday and made an apology. That retraction says a lot about just how influenced things are in the media. Himself and Steven Thompson stuck together in condemning Lennon. It will be interesting to see what else comes out of this especially when you saw Chris Sutton’s show of support and mockery of the Ckub 1872 statement. These people have very short memories. If they were ever in any doubt about what I’m referring to you can read about the death threats Lennon had after that game which is now as ongoing investigation. The key part of every Lennon reaction is the abuse he’s taken for nearly two decades. Though tough on the field, he wasn’t a dirty player and far worse have existed in the Scottish game before, during and after his time as Celtic’s number 18. You don’t have to question why fans at all grounds dislike him so much. He’s a Catholic Northern Irishman with a big presence and personality playing for Celtic. This is red rag to a bull if you’re of the union flag waving, sash wearing variety. These people are also Scotland’s shame. The irony is that despite the football authorities and the Scottish government’s efforts to address bigotry and sectarianism in our sport, they are strangely lenient or silent when Lennon is a victim and his attackers are out in the open for all to see. How many times has he been threatened, attacked and received parcel bombs in the mail targeting him and his family? More to the point, what has been done about it? Nothing. Put simply, Lennon is enemy number one for those whose purpose in life is to inflict anger and hatred. Just like the Linfield game and Leigh Griffiths, if you can’t control your emotions in the stands then the problem is in the stands not on the pitch. The hurt amongst the Ibrox support is massive. Their club died thanks to their former knighted leader and his cronies. That slow painful death occurred during Celtic’s continuing reign as Scotland’s number one club. A club with a business model to die for. Lennon is a constant reminder to the Ibrox fans and their new club, of their old club’s ultimate failure. That must hurt very much indeed. He isn’t going to go away though. He has endured everything you have thrown at him for nearly twenty years. It’s time for those of you filled with hatred to move on. We don’t need your kind. Lennon is here to stay. You lot are not welcome. ← Armstrong needs to be open about his future or move on for the good of the club. Hi wonder how long Michael Stewart will last at the BBC now for not going along with the party line. How long before he gets threatened by club 1872. Exactly! He should start thinking about hooking up with Jim Spence now.